In between the trees, it’s cool and dark. The air is pungent with damp earth and tree smells. There are virtually no birds, no bugs, and no hint of wind. The daylight streams through in weak beams of light, fighting its way to the forest floor past sprawling branches and behemoth trunks. In the Redwoods, it’s almost always dawn or dusk. The California Redwoods are one of the most unique species in Northern California. In January, I was offered the chance to spend a weekend among the trees and leaped at the chance. Little did I know that Redwoods are almost impossible to conceive, older than almost any living thing on the planet. They live in an interconnected network, supporting one another, reaching for the sky. Each tree is a testament to the passage of time – and a reminder how important it is that we protect green spaces in and near our cities. Many travelers want to see Redwoods near San Francisco, as they’ve been popularized in movies (Return of the Jedi, anyone?). If you’re one of those travelers, here are my tips to see California Redwoods on your trip… and why I don’t believe Muir Woods is the best place to experience these fantastic trees. Edit: After publishing this story a few days ago, I heard from my friends at Save the Redwoods League. They just released a cool trip-planning feature if you want to go to the Redwoods. Check out my thoughts below, then click here to use their tool to plan your perfect Redwoods trip. For most people in the Bay Area, the first place that comes to mind when they want to see the Redwoods is Muir Woods. 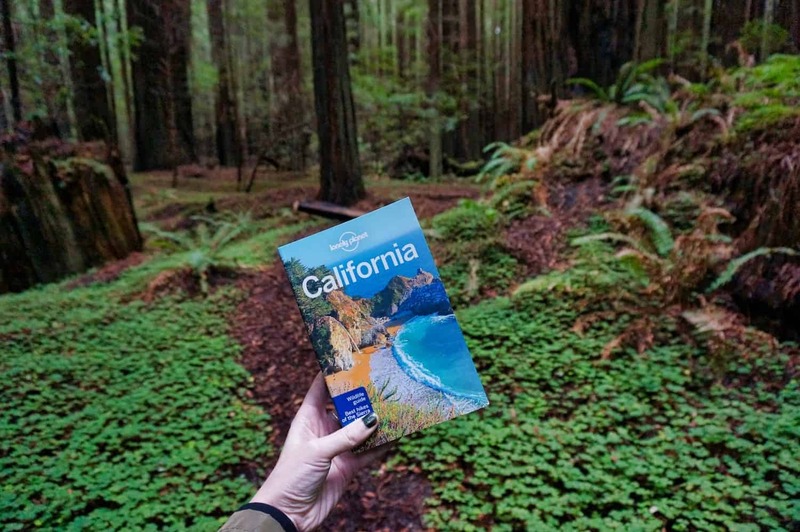 A 35-minute drive from San Francisco, Muir Woods is an easy day trip for most cities in the Bay Area – especially when there’s no traffic! Unfortunately, Muir Woods’ proximity to San Francisco also makes it the most popular place people go to see the Redwoods. You can expect to encounter hoards of fellow travelers at Muir Woods, so many that starting in 2018, you need a reservation to visit. While Muir Woods is certainly impressive, I personally find it hard to enjoy the trees when navigating around slow-moving city folk and the quiet spaces are interrupted by people loudly asking questions and making observations. For this reason, I certainly recommend Muir Woods if it’s the only place you can get to. If you only have one day in the area and want to see the Redwoods, then it’s your best option, but there are better places further north. Starting in 2018, you need to make a reservation to visit Muir Woods. This must be done in advance on the National Park Service website. You cannot just drive to Muir Woods without a reservation; parking is limited to reservations and you are at risk of fines or having your car towed. The best time to visit Muir Woods is weekday mornings, especially when the fog is still hanging in the trees. Weekends and later in the day, you’ll face more crowds. The best way to visit Muir Woods is to park and take the Muir Woods Shuttle. Learn more and see timetables on the Marin Transit website. The shuttle runs May through October each year. Admission to Muir Woods is $10 per person, and the Muir Woods Shuttle is $5 per person. Within Muir Woods, be sure to spend time in Cathedral Grove, the most famous site in the park. Sometimes, rangers lead walks and talks through the park; you can check the program board near the park entrance upon arrival to see any daily or special events that day. There are three main hiking trails: a 30-minute loop, a 60-minute loop, and a 90-minute loop. You can hike and camp more, but you’ll cross into Mount Tamalpais State Park to do so. California Parks has a great resource and map on their website. As I suggested in the above section, I believe a better place to see the Redwoods is in Humboldt Redwoods State Park. This state park is a short four-hour drive north of the Bay Area. Humboldt Redwoods State Park is home to many of the most famous Redwood groves in California. For being “only” a state park, it is surprisingly good at fulfilling any desire you have to surround yourself with and learn about California Redwoods. The faster option is four hours north on U.S. Highway 101. This route will take you through San Rafael, Petaluma, Santa Rosa, and many small towns. The more leisurely, scenic route, is along famous California Highway 1. This drive takes 7-8 hours but is worth it if you have the time. You’ll work your way up the Northern California Coast, passing through Point Reyes, Mendocino, and Fort Bragg before turning inland. For my recent trip, I took Highway 101 on my way north. I split the drive south by cutting out to Highway 1 to Fort Bragg, then turning inland to drive home on California Highway 20 and 101. Humboldt Redwoods, the nickname it is affectionately given by locals, is 53,000 acres – 17,000 of which is old growth forest. It’s in these 17,000 acres that you can find the biggest, most beautiful trees, and several famous groves. It’s important to understand the history of Humboldt Redwoods to make sense of why some of the areas in the park are so significant. One hundred years ago, in 1918, the Save the Redwoods League started their efforts in what became Humboldt Redwoods State Park. This was in response to deforestation in the region to continue rebuilding San Francisco in 1906. Three years later, in 1921, Humboldt Redwoods State Park was added to the California Parks system. 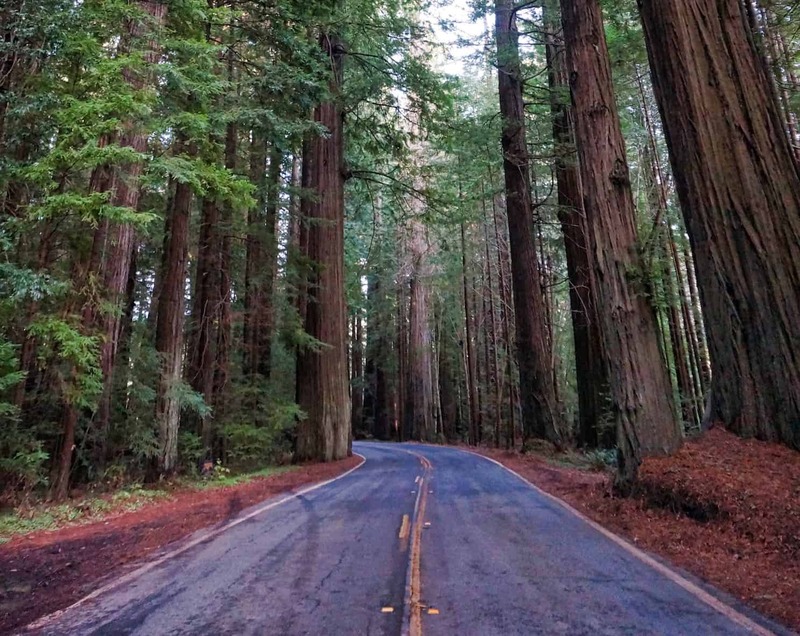 If you only have time to do one thing in Humboldt Redwoods, driving the 31.6-mile Avenue of the Giants is it. This winding stretch of what was once U.S. Highway 101 is now called State Road 254 and cuts through the center of Humboldt Redwoods and the small communities along its route. It’s slow, bumpy at times, and incredibly narrow where the tall trees press in, but it’s one of the most scenic ways to see the Redwoods quickly. If you have time, you should really stop off and see some of the other sites on this list… ? Located just north of the small town of Myers Flat, the Humboldt Redwoods State Park Visitor’s Center is a must-stop spot if only to get oriented to the rest of the park. Here, you’ll find a history of the park, memorabilia, and helpful docents to show you maps and give directions to the best groves. 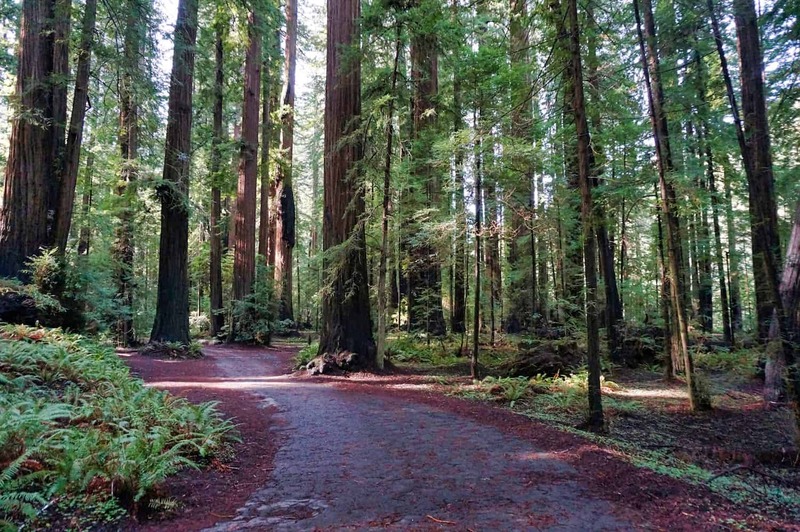 Created by the Save the Redwoods League, Founders Grove is the most ‘must-see’ spot in Humboldt Redwoods. Here, you can gaze up in wonder at the towering Founders Tree, and take a self-guided interpretive walk through the woods. You can also see the fallen Dyerville Giant; before this tree fell in 1991, it measured 370 feet tall (taller than the Statue of Liberty) and was estimated to be at least 1,500 years old. Now, it stands in a clearing of downed Redwoods, as several others have fallen in wind storms the past few winters. Known officially as the California Federation of Women’s Clubs Grove, the Women’s Grove is perhaps overshadowed by Founders Grove and Rockefeller Forest nearby. Nevertheless, this grove was purchased by and honors the efforts of California women to preserve the Redwoods in the early 20th Century. In this grove, you can also find a beautiful four-way hearthstone designed by famous California architect Julia Morgan. The largest section of old growth in Humboldt Redwoods is the 10,000-acre Rockefeller Forest. After a trip to see the beauty of the region John D. Rockefeller Jr. purchased the land from lumber companies in the early 1930s, and it was named in his honor after his death. One of the most picturesque spots in Humboldt Redwoods, the Grief-French-Bell Grove is beautiful not because of the trees themselves. The whole area is filled with a downy layer of Redwood sorrel, the clover-like plant that covers the forest floor. This grove is also home to the Girdled Tree, pictured below as well. This tree was so named after lumber barons removed most of the tree’s bark for demonstration. Astonishingly, the tree survived and still towers over its neighbors. Close to the Greig-French-Bell Grove, Drury Chaney Trail is another spot if you want picturesque photos of the Redwoods and sorrel undergrowth. I took the picture of the Lonely Planet California guidebook below near Drury Chaney trail. During my weekend exploring California’s Redwood Coast, I stayed as a guest of the Historic Benbow Inn. A few miles south of the southern entrance to the Avenue of the Giants, this historic property is approaching its 100th year in operation and has stunning historic importance and records of life in the region over the past century. As you can see, the Historic Benbow Inn is has preserved the old style in their rooms, including some knick-knacks – and daily sherry complimentary for guests. The rooms oscillate between being dated and ‘quaint’ in design and the walls are paper-thin when the room next door is host to a group of rowdy bachelors on a Saturday night. To balance this, the property and surrounding countryside are stunning, and they’re making exciting new developments to rooms and the property as a whole. Next year, some of the new rooms will be on par with any five-star accommodation in the area. Rooms start from $135/night. Hopefully, you’re sold on why Humboldt Redwoods is the best place to see Redwoods near San Francisco. 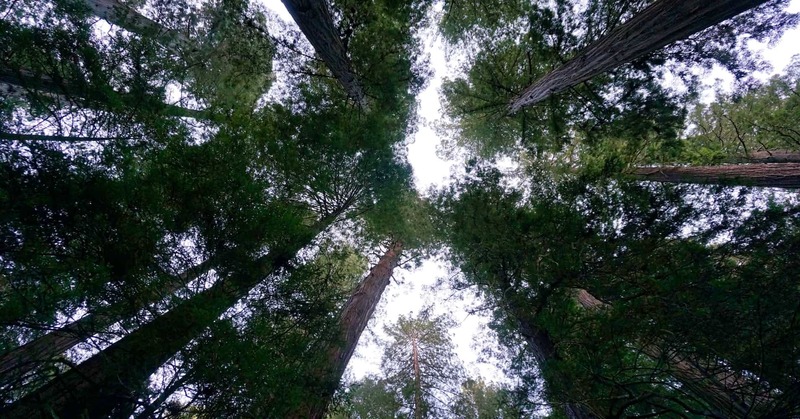 Unlike Muir Woods, you’ll have space to enjoy your time among these massive trees. You can soak them in, and even try your hand at forest bathing. Lonely Planet recently named California’s Redwood Coast as their #1 U.S. destination for 2018 as part of their Best in the U.S. campaign. Humboldt Redwoods is the lowest large area where you can experience the magnificence of the Redwoods first-hand and see why. To plan your trip, I recommend grabbing a copy of the Lonely Planet California guide. The newest version is due out in February 2018 (linked above). I used my guidebook for this trip – and I found it was incredibly useful and up-to-date. It was my first time using a guidebook to plan a trip, and I will share more about that process in an upcoming post. Summer is the most popular time to visit Humboldt Redwoods, especially over long holiday weekends (and weekends in general). If you have the time, plan at least one weekday into your trip. Similarly, a shoulder season or off-season trip still promises great weather and the trees look beautiful year-round. You should definitely consult the website for Eureka-Humboldt Visitors Bureau/Visit Redwoods, visitredwoods.com. I worked with their team and consulted their website repeatedly in my planning process. I can’t stress enough that a stop at the Visitor Center is worth making. During our stop, a woman named Corky gave us the most up-to-date information about the park that day – including her preferences on the most picturesque spots and where to look for albino Redwood trees. [info]Endless thanks to Richard from Visit Redwoods for guiding me around during my trip to Humboldt Redwoods. In between biology lessons about the trees, we discussed space, history, and sci-fi movies. Thanks, Richard, for helping tell the trees’ stories, and bringing them to life for me. We had limited time in San Francisco so we never got to see the Redwoods, but it’s totally on my list! This is a ton of great information (crazy you have to make a reservation now!!) . Your photos are amazing and totally capture the grandness of the area!! Thanks, Katherine! I hope you can make it back and see the Redwoods at least for a little while. They really are stunning! Hi, Do you have any other recommendations closer to SF (less than 90 min) other than Muir? Akilan, thanks for your comment! I’d recommend checking out Redwoods Regional Park near Oakland. That’s the other close opportunity to encounter Redwoods without driving as far north. I hope this helps! Congratulations on your collaboration with Lonely Planet! That is very impressive and what a wonderful travel experience, too! The Redwoods are among my favorite places in California! Thanks for your comment, Keating! Hopefully this post is some inspo to make it up here! Bookmarking!!! I realllly want to see Redwood trees but to get to any state park is so expensive and a long journey for me as I live in the Caribbean. I do want to take a nature based vacation next year so I’m looking at these or the sequoia trees. Humboldt is now definitely on my list! We’ve been talking about maybe going to SF and now I know I have to. Those upshots are magnificent! Oh wow these are some amazing trees and just so peaceful looking too. Definitely would want to check out Humboldt rather than Muir to full appreciate them.